Sometimes I have an overwhelming urge to write about things that are nothing at all to do with sewing or crafts. I love a good metaphor. Sometimes they’re the best way of expressing things. So here are some of my favourite metaphors. And if you have one you’d like to add, please do in the comments! Roads with grass growing down the middle are my favourite kind of road. Living where we do means that there are lots close by and I know where they all are! I like them because they represent the road less travelled. They are roads that are less travelled, otherwise the grass wouldn’t be there! Sometimes leaving the main road and taking one of these little lanes means that you end up somewhere interesting. Often they don’t go anywhere interesting, but it’s fun to see where you end up. I have no desire to get onto the motorway of life. I don’t want my life to be dictated by other people’s expectations. I don’t want to be heading in the same direction as everybody else because somebody who doesn’t know me or my situation at all has decided that that is the way to go. I like trundling down little country lanes with not much idea of where I’m going. I’ll find out when I get there! Walking down these roads is such a joy. It’s peaceful, and when you do meet people on the way, they’re more likely to be kindred spirits because they’ve chosen that road too. I want to live life in the way that suits me and my family. Different, weird and unusual are all good things. I’m going to try to run a kitchen table business instead of having a career. I want to take care of my kids myself, and that includes them not having ipads but running around outside with no shoes on. I’m going to do the school run in a tutu, and I’ve no intention of going near anything that looks like a metaphorical motorway if I can help it. As metaphors go, this is possibly my favourite! A warning first: maths isn’t my thing and I can’t guarantee that I’ve got this completely right. As far as I understand it, chaos theory is when you take a group of random numbers, do some kind of maths thing to them and suddenly, there are patterns. If you do something (I’m not sure what!) to every third number, you get a pattern of repeating triangles. If you do something to every 6th number, you get a fern. Other stuff can be done to the numbers which will turn a collection of messy numbers into fractals. The reason why this is one of my favourite metaphors is because our lives so often seem to be chaotic. Stuff is going on all around us, and even with technology and everything that living in the western world offers, there’s so much we can’t control. It’s hard to make sense of things sometimes. Chaos theory reminds us that sometimes, things might seem to be chaotic. But maybe all we need is a different persepctive. If we look at chaos in a certain way, perhaps we won’t see a random jumble of mess anymore, but something that makes perfect sense. It’s so hard to choose a favourite book. It’s like choosing a favourite child! 2 of my favourites are Tom’s Midnight Garden and The Secret Garden. I’d recommend them both, even though they’re children’s books! Tom’s Midnight Garden (affiliate link) is about a boy who is sent to stay with his aunt and uncle because his brother has measles. Poor Tom is cross because it’s the start of the summer holidays and he and his brother had plans to do all sorts of fun stuff out in the garden. His aunt and uncle live in an old house that’s been converted into flats. They don’t have a garden. One night, as Tom’s lying in bed trying to sleep, he hears the clock in the hall chime 13. He gets up to investigate, but can’t see the face of the clock. He realises that if he opens the back door, it might let in enough moonlight so he can see what time the clock actually says. Tom creeps downstairs, opens the back door and instantly forgets all about the clock. Instead of a tiny yard where bins are kept, there’s an enormous garden. The garden is only there when everybody else is asleep, and Tom sneaks out every night. In the garden is a girl about the same age as him, called Hatty. Night after night, Tom creeps downstairs and spends several happy hours in the garden with his friend. But as the summer winds on, Hatty gets older. Eventually she is much older than Tom, almost grown up. Then one night, Tom goes outside expecting to find the garden and it’s not there. There’s a lovely twist at the end, which I’m not going to tell you because it will spoil the book if you decide to read it! In The Secret Garden (affiliate link), several lonely, unhappy children find friendship and healing for emotional and physical hurts, which they are able to extend to adults around them. When they find the garden, it’s been neglected and everything seems dead. But with a little bit of gardening from the children and the arrival of spring, the garden transforms itself as well of the lives of its little caretakers. A garden represents a safe place. It’s somewhere to have adventures and to enjoy the long days of summer. It can also represent hope. Unless it’s been dosed with large quantities of weedkiller, even if everything seems dead, it probably isn’t. Hope returns with the spring. Even if things seem hopeless, give it time and a little shoots of hope will appear. Doors in old buildings are often interesting. There wasn’t UPVC in olden times and heavy oak doors are so much more intriguing! When a door is closed, we can’t see what’s on the other side. The only way to know is to open it and see! Sometimes a door will only open if you have the key. It might only be possible to get through the door at certain times. You might have to wait for somebody to let you in. Some doors will shut behind you, and you won’t be able to open them again. A door represents a change. Sometimes it’s something we have to go through, sometimes it’s a choice. It might mean not being able to go back to a previous way of life. Certain choices can only be made at the right time, when the circumstances are right. Making a decision sometimes depends on somebody else. Occasionally the right choice might not obvious, and we have to hack away at the ivy to find the door that’s hidden. I love a junk shop! They are treasure troves of possibilities. Last time I visited the one in Long Sutton, I came out with some vintage teacups, a matching cake plate and a hand embroidered vintage tablecloth. Lots of the furniture in my house has come from IKEA. But I also have several bits that started off as tatty, unloved bits of junk. It’s amazing what a coat of paint and some new handles will do! I also like the idea of having pieces of furniture that are not the same as what everybody else has. Tatty bits of furniture are an illustration of looking past the obvious to see the potential. We should never write people off just because their faces don’t fit, or because they are odd, or because life has knocked them about. All they need is someone to give them a chance. When I was at university I had a lovely friend called Victoria. She had beautiful blond hair, she was very clever and she was extremely kind. I remember one occasion when I was in a tizzy over an essay. Computer problems were compounding the other issue that I’d left it all a bit late, and I wasn’t sure whether I’d get the essay finished and handed in on time. 20 years on, I can still hear Victoria telling me that there was no need for the essay to take on supernatural proportions. Anyway, the end of this rather boring story is that Victoria helped me with the computer issues and I got the essay finished and handed in on time. The Stay Puft Marshmallow Man is a metaphor for something small taking on supernatural proportions. At the end of the original Ghostbusters film, the chief ghostbuster tells the others to empty their minds and think of nothing so that the evil ghostie they’re trying to zap can’t take on a physical form and destroy the city. Unfortunately, one of them thinks of the Stay Puft Marshmallow Man from a packet of marshmallows. The evil ghostie becomes an enormous Stay Puft Marshmallow Man and starts destroying the city. Happily the ghostbusters zap him in time and the city ends up covered in marshmallow. For some of us, if we’re not careful, small things can end up ridiculously out of proportion. Even something like making a phone call. If I don’t, it ends up being such a big deal I either end up not doing it or being far more worried about it than is sensible! I should probably say that the credit for the last of my favourite metaphors goes entirely to my friend Helen. I hope you’ve enjoyed this little bit of weirdness. Next week we’ll be back to sewing tutorials! This is a guest post by Alex Farley who runs a cleaning business in London. It is not easy to keep your stuff organised especially if you use it frequently. Many people have this kind of problem, including me.You should see what my sewing room used to look like! I had dozens of projects on the go and somehow, as time was not on my side, you can imagine the chaos my sewing room was in. That was the moment when I decided it was high time I found creative and easy ways to keep my place clean and organised. 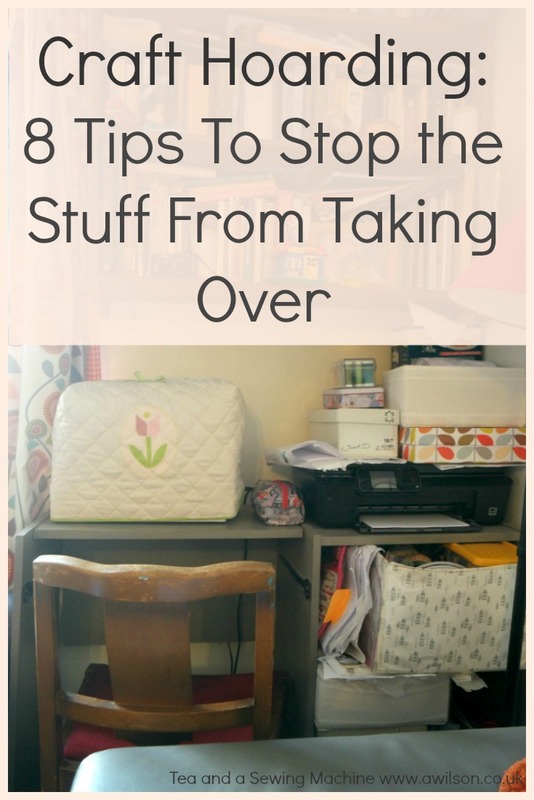 If you are like me and you have the same or a similar problem, I would be happy to help you, and I’m going to share with you several ways to help you with sewing room cleaning and organisation. Any time you are about to apply proper deep cleaning of an area, no matter whether a closet, a desk or a sewing room, you need to take everything out. Leave the space free of any fabric, materials and tools. This will make it is as easy as a pie to dust all the shelves. Vacuuming is also a lot easier if there is nothing in your way. While you do the cleaning, you can use this as an opportunity to decide what materials need to be stored and what you are not using so that you can throw them away or donate them and free up more space. Remember that every space counts. The best piece of advice I can give you is to categorise all your stuff. Now when you have cleaned and emptied the shelves, place all the sewing supplies and materials there. It is understandable that the place will get messy again in the very near future, but that is nothing to worry about. Just make sure that when you take something out, put it back in the same place. This way, it will obvious if you need to replace something you’ve run out of. When you organise the place, think and act smart. I have pullout drawers and I have to say that they are very convenient as they make every inch of them accessible. I do believe that the best sewing rooms are those which are regularly cleaned and well organised. You do not want to spend day and night searching for that exact colour of ribbon, do you? I probably have tons of ribbon scraps and at one point, they were taking over the entire room. A ribbon scrap here, a ribbon scrap there. So I decided to get my act together. It is not nuclear physics so you can try it, too. Wooden spools, tape and pins is all that you need. Get a piece of tape and stick the ribbon end to the spool itself. This way you can easily wrap the ribbon around the spool and then use a pin to secure it. As I said, it is not nuclear physics, is it? Now it is much easier to organise ribbon scraps, don’t you think? If you have a plethora of craft buttons, here’s a simple way of storing them. All you really need is a hot glue gun, plastic storage tubes and a box or a basket where you will place the “invention” once you are done.First, sort the buttons into shape, size and colour. Then get the hot glue gun and stick a button as an identifier to the lid of the tube. Put all the buttons in the containers and that’s it. Hopefully, these sewing room cleaning and organisation ideas will come in handy to all of you. Sometimes when we have so much, it’s nice to think about what we can do for other people. Every parent’s worst nightmare is something awful happening to their child, whether through accident or illness. In our relatively safe modern world, with wonderful healthcare, our children usually enjoy happy, healthy childhoods. But sometimes children fall ill, or are born with medical complications. And when it does, parents often feel very alone. This is where Project Linus UK comes in. Comfort and support come in all different forms. Anybody who’s ever been given a handmade blanket or quilt will know what a treasure these are. It’s like somebody is giving you a hug, even if they’re not there! Project Linus is a volunteer organisation that distributes handmade quilts and blankets to ill babies and children in hospital. It was started in America in 1995 by Karen Loucks who wanted to help children who were receiving treatment for cancer at her local hospital. Since then, 4 million quilts have been delivered worldwide. Not only do the quilts provide comfort and reassurance for the children who receive them, it makes a difference to the parents who feel that there are people who care. So if you’ve got some time, you need a project and you want to help people, it’s easy to get involved! Quilts are welcomed in a variety of sizes (there’s more information here). There are free quilt patterns, and a pattern for an incubator cover here. If you’d prefer to knit or crochet, there are patterns here for blankets, and also for hats for premature babies. To find your local co-ordinator, there’s a list here. 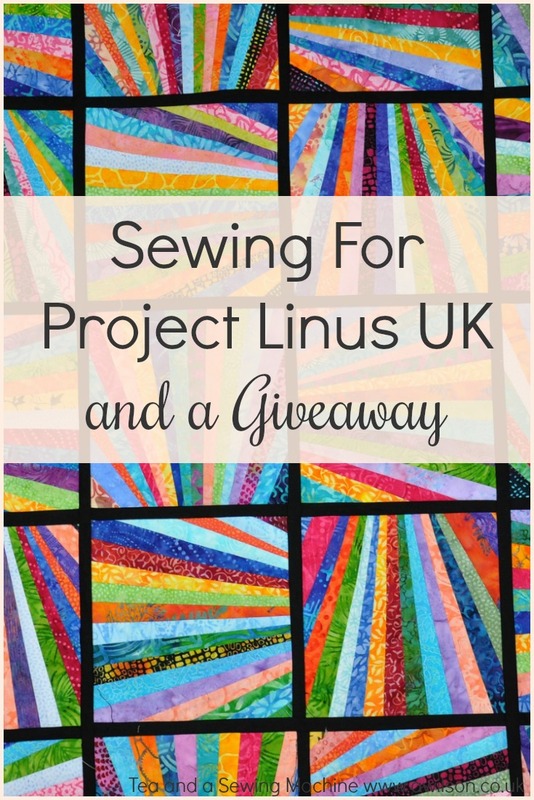 To promote the work of Project Linus UK, the magazine Sew Inspired are featuring a quilt-along to encourage people to have a go at making a quilt, and to donate the finished quilt to Project Linus UK. Sew Inspired have worked with sewing manufacturers Threaders to produce a quilting starter kit. The kit contains an A3 cutting mat, an acrylic ruler and a rotary cutter, and Crafters’ Companion have one to give away. If you’d like to enter the giveaway, please fill in the form below. The giveaway ends at 11.59 pm BST on Sunday 15th April 2018, and the winner will be notified by email. In September 2010, I was in Sainsbury’s in King’s Lynn when a magazine caught my eye. It was the magazine Craftseller. On a whim I bought it, and although this is a cliche, it changed my life! I’ve always enjoyed making things, and I’ve loved sewing since I was 10, but at that point I hadn’t used my sewing machine for a while. Reading Craftseller inspired me to take up sewing again. I rediscovered my sewing machine and eventually opened a shop on Etsy. It is also the reason why this blog exists! Unfortunately I had absolutely no idea what I was doing, either with the blog or with Etsy! The magazine made it sound so easy. Open a shop, slap up a few listings and wait for the sales to come rolling in. I made a few things, took some photos (they were awful, grainy, blurry and dark! ), wrote some half hearted descriptions and sat back and waited. I read the Etsy success emails but I didn’t get it. I realised that my shop was weird but I didn’t know how to make it unweird. I thought my photos were fine, I didn’t understand what having a cohesive looking shop meant in a practical sense and I couldn’t understand why some people were enjoying success when I was not. Eventually I gave up. The shop stayed open, but I didn’t do anything with it. Over the course of 5 years, I sold 5 things. Then about a year ago, I decided that if I was going to be selling on Etsy, perhaps patterns and kits would do better than a peculiar collection of one of kind things. Thanks to the blogging, my photography had improved and I understood more about branding and photos needing having a particular look. I’d learnt a lot about blogging, and I had realised that there was a lot to learn about selling on Etsy too! So a year on, although I can’t claim that Peacock in a Pear Tree has been a runaway success, things have definitely improved. From making 5 sales in 5 years, I’ve made about 70 in the past year. Not masses of sales, but much better! I’m not claiming to be an expert. Clearly I’m not one! And in the words of Einstein, the more I learn, the more I realise how much I don’t know! But I have learnt a lot over the last year. 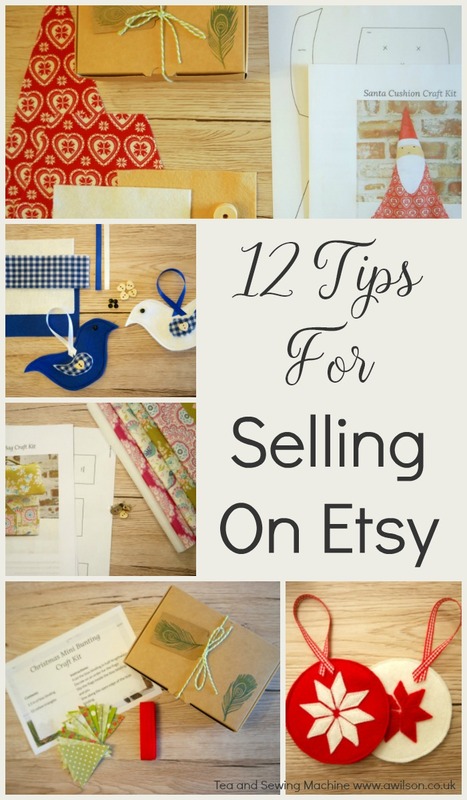 So if you’re considering selling on Etsy, or if you have opened a shop recently, here are 13 tips for selling on Etsy that I hope you’ll find useful. It’s easy to get carried away, but in the end what you call your shop doesn’t make that much of a difference. People aren’t going to decide whether or not to buy from you based on the name of your shop or your logo. You need something, and it needs to look nice, but it doesn’t need to be fancy. So pick a name. Something memorable is good, but Creative Sue Designs or Crafts and Tea With Bea will do, then you need to sort out a cover and a logo. The cheapest option is to make something yourself. If you’re not a graphic designer, keep it as simple as possible. Have a look at other people’s shops on Etsy and you’ll find plenty of logos and things that are very simple. Canva is a free design program that has plenty of free templates and fonts and things, and is fine to use if graphic design is not your thing. If you’d rather not make one yourself, there are people on Etsy selling ready made shop sets, or you could pay to have one designed. When I was starting out, I heard this so many times but I ignored it! This was not a clever thing to do! Etsy is visual. Try it yourself. You’re going to click on the things that have lovely, clear photos that are well lit and make the thing look gorgeous. That dark, grainy picture with the flash reflection is not going to get any interest if you’re selling on Etsy! You don’t need a fancy camera, you just need some good pictures! Use natural light and turn the flash off! You don’t want direct sunlight, but there needs to be plenty of light. Think of a cloudy summer’s day. Not dark and gloomy, but no glaring sunlight either. Choose a background and use that for all your pictures. This will help to give your shop a distinctive look. For my backgrounds, I use the sliding part of the computer desk that I commandeered for the sewing machine after we got a laptop. I took the sliding part off and covered it with sticky backed plastic that is supposed to look like wood. One side is white, the other is a pale brown. Although on the roll, the plastic looks unconvincing, in a photograph it looks like actual wood! You can buy this stuff on Amazon. These are affiliate links. For larger things I use the wall in the garden. Light colours are best. Other options include a wooden table (if it’s light coloured), a large piece of board covered in the plastic wood stuff I mentioned before, or a piece of wood painted or stained a light, neutral colour. Your photos will probably need editing. Consider turning up the brightness, contrast and saturation, and you might need to crop them. Before uploading, the photos will need to be 1024 pixels wide otherwise they’ll be too large. If you need help with your photography, there are plenty of books and websites out there. One that I’d recommend is Learn Blog Photography. SEO is search engine optimisation. Etsy is a search engine, just like Google and Amazon are. Optimising your listings will increase the chances of them being found. Most people don’t go beyond the first couple of pages of search results, so you want your stuff to be as high up the list as possible. Some people will charge you a lot of money for telling you exactly what affects search results! Doing stuff to your shop regularly. There are plenty of shops on Etsy that people have started then abandoned, so Etsy favours ones that are clearly active. Tinkering with your shop and adding new listings shows that your shop is alive and well. Having a long title. Include in the title all the words that you think people might be searching for that are relevant to your listing. Making sure that your tags match the words and phrases in your title. The title of one of my listings is Santa Cushion Craft Kit Father Christmas Craft Kit For Adults DIY Kit DIY Gift Christmas Home Scandi DIY Christmas Sewing Gift Sewing Kit. The tags for this listing include santa cushion, craft kit, Father Christmas, craft kits for adults, you get the idea! Using the keywords in your description. The keywords for the Santa cushion above are Santa cushion craft kit and craft kits for adults. This helps your listing to be found in Google as well as Etsy. Pick Something For Your Shop That’s Sustainable. This goes for the type of things you’re selling on Etsy as well as individual items. If you find something very fiddly to make, or if the materials are hard to find, or if you find it boring, it’s going to be difficult to sustain making lots of them. I found very early on that I don’t enjoy making the same thing over and over again. Not long after I’d opened my shop, somebody sweet said that she like my heart garlands. I had several of these, so I decided to make some more. However, once I’d made a couple, my interest had waned! I made a few more, but I was bored of them and some of them I never finished. This was one of the reasons I abandoned my shop until last year. By then I had discovered that I liked the process of developing an idea, so putting together PDF patterns and craft kits didn’t have same affect on my attention and I can do this without getting fed up or bored. If you are hoping that selling on Etsy will become your job so that you can give up your boring day job, why give up something you find boring just to be bored doing something else! Running your own kitchen table business gives you the opportunity to do what you enjoy, and although some of it is likely to be dull (accounts! ), boredom should not be the measure of your days. Make Sure That All Aspects Of Your Shop Show You As Competent. I’ve already mentioned photographs, but there’s other stuff you can do too. Make sure that all the elements of your shop are filled in. Photographs, your shop description and shop policies will all show that you are serious about what you are doing. Only list items that are made as well as you are able to. It’s better to sell things that are simple but beautifully made, than items that are harder to put together and are not made to such a high standard. Know your limits and do your best! Consider how you will package up your items, and include a photo in the listings. I recently bought some new boxes for my kits. I stamp the boxes with I stamped with a peacock feather and I tie a label around the box with bakers’ twine. This makes the whole thing into a treat for the person who’s buying it! Don’t worry about nice packaging pushing the cost of the thing up by 50p or so. Remember that Etsy shoppers are not usually trying getting stuff for cheap. They will mind if you send them a hand knitted baby cardigan in an old cat food box. Wrap the cardi up in some pretty tissue paper, put it in a nice box and add the cost to the price of the item. Keep An Eye On What Sells and What Doesn’t. If you have particular things that do well, keep plenty in stock and consider how you could develop some more items that are similar and might also do well. For example if you sell handmade baby clothes and the little leggings do well, you could try more leggings in different colours and prints. Pricing your handmade items can be very difficult. Always In the back of our minds is what we would pay if we bought something similar from Primark. However there are reasons why stuff on the high street is relatively cheap. Mass production, inferior materials and exploitation of workers in poorer countries being among them. People who buy from Etsy do so because they don’t want mass produced. They want something special, one of a kind or at least one of a limited number, from a small business not a faceless corporation. If you don’t charge enough to make a profit, then it’s a hobby, not a business! How much skill was involved and how easy it would be for somebody to make the same thing themselves. Don’t forget listing fees, Paypal fees and Etsy Payments fees! At the very least, you need to add up how much it cost to make it, plus listing fees, then multiply that by between 2 and 2.5. That way you’ll be making a bit on every item you sell. Have a Range of Items For a Variety of Budgets. Etsy isn’t like Ebay, where people are often looking to pay as little as possible. Etsy shoppers are usually looking for something special, not the cheapest thing they can find! This means that it’s fine to have some pricier items in your shop. But there will also be people who are looking for smaller, more inexpensive things, so you need to make sure that you are catering for both groups of people. What I’ve found is that I’ve sold more of the cheaper things, with some orders being for several of these. Although I’ve sold less of the pricier things, the profit margins on these are greater. The pricier kits take more time to develop and often more time to put together, whereas the cheaper kits are much quicker to make. So decide on a price range and make sure you have stuff that covers the range. If you’re not sure what the price range of your shop should be, look at the other shops on Etsy that are within your niche to get an idea. Don’t Have Too Many One of Kind Things. When you’re selling on Etsy, one of a kind things are a lot of work. Each one of these has to be designed, made, photographed, listed and promoted. In the end you’re only going to sell one of them! It makes more sense to make several of something, then you can aim to get more sales from a similar amount of work. When sales eventually started coming in, I quickly realised that it was no good spending 2 hours putting one kit together. It all took too much time that I could have spent doing something else. Space is an issue at my house, and I don’t have room to have dozens of kits all made up ready. But there are plenty of things that can be done to speed up the process. The first thing I did was streamline the postage end of things. Putting jiffy bags, tape, bakers’ twine, labels and a pair of scissors in a box, made a big difference to how long it took to get things ready for posting. Now I also have boxes and labels ready and stamped, and kit bits ready to go in freezer bags and boxes. When an order comes through, all I need to do is grab the relevant bits, pop them in a box and stick them in a jiffy bag. It’s all much quicker! Getting organised early on will give you more time for developing stuff for your shop and promoting it.. Although the craft magazines will have you think that selling on Etsy is easy, there is a lot to learn. Out here in internetland there are plenty of people out there who are happy to share the benefits of their experience. Some people will want you to pay for that information, but there’s plenty out there that’s free or in the form of inexpensive ebooks. This is especially important if you have no experience of selling things or running a business, but even if you have, it’s worth finding out how Etsy works and what other people have done to make their Etsy shops a success. There’s Never a Perfect Time, So Just Go For It! If you’ve just had a baby, or you’re moving house, or you’re dealing with a messy divorce, now is probably not the best time to start selling on Etsy. Waiting for the perfect time though is another matter! The perfect time will never come, so if this is something you’re considering, now is as good a time as any. You don’t have to do it all in one go. Decide what you’re going to sell. Decide on a name. Make a shop banner. Then go for it!